Editor's Note: This story is revised from the May/June 1990 issue of South Dakota Magazine, and also appeared in South Dakota’s Best Stories. To subscribe, call 800-456-5117. Mr. Callihan’s homemade horseless carriage would be any museum’s pride and joy today. Unfortunately, he had a better sense for mechanics than for history. He dismantled it when he needed parts for another piece of machinery. Edward Scott Callihan was a herald of the Machine Age, and like the prophets of old, he was not always the most welcome of men in his hometown of Woonsocket. He was constantly tinkering with all things mechanical, an eccentric, overflowing font of ideas — a man who didn’t have time to get along with his neighbors. His more outlandish ideas were an ongoing source of amusement around town, but even the locals were surprised when Callihan clattered into Woonsocket aboard a steam-powered, kerosene-fueled horseless carriage. The year was 1884, 12 years before Henry Ford built his first automobile. With the exception of a few tinkering types here and there, few had ever seen such a thing. Callihan’s vehicle was a tricycle design, with a single, spoked wheel in front and two in the rear; he sat behind the steam boiler on a seat borrowed from a reaper with the steering levers firmly in hand. 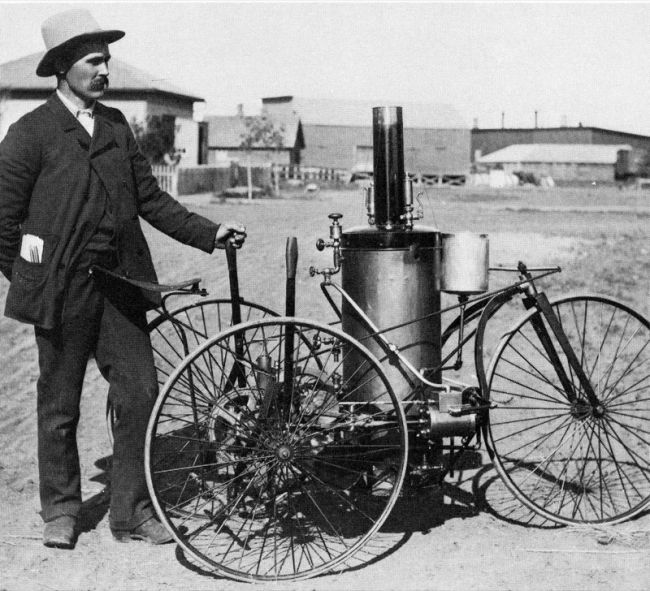 His two-cylinder contraption had a top speed of 15 miles per hour. The run from Callihan’s home near Artesian to Woonsocket, a distance of about 20 miles, took two hours. With a whistle and water gauge mounted on the dashboard, Callihan can even be credited with inventing options. Callihan never went past fifth grade. His mechanical aptitudes were inborn, his inventions created through trial and error and gifted insight. He considered himself primarily a farmer, and most of his tinkering was devoted to finding ways to lessen the toil of farming. 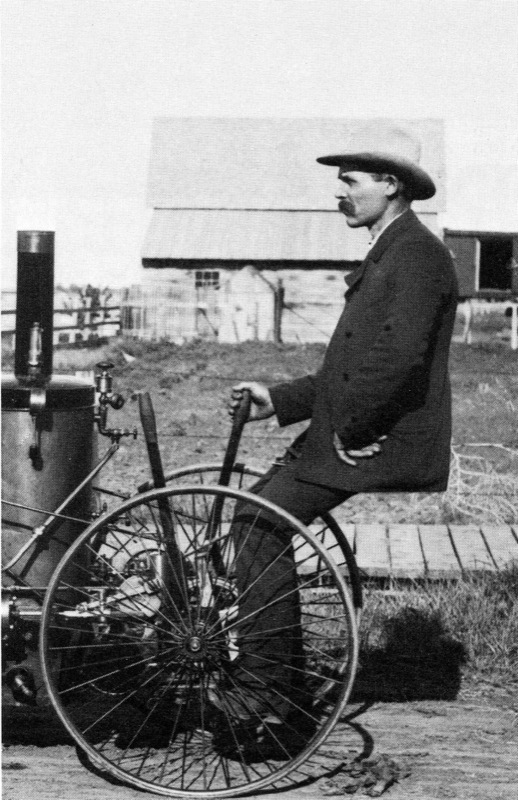 Callihan produced well-drilling rigs and threshing machines, even a wind-powered turning lathe, but nothing stirred the imagination like his horseless carriage. Horses reared and children charged about, enjoying the racket as Callihan pulled up to the general store. Among those who could do very well, thank you, without a revolution in transportation was the local constable, who ordered Callihan and his infernal machine off Main Street. Callihan at the controls of his invention. Shortly after the turn of the century Callihan produced his first gasoline-powered automobile. A group of neighbors, by that time accustomed to seeing him astride all manner of strange contraptions, gathered to watch his first test run. Callihan set off down the road, and upon his return the crowd began waving and clamoring for a ride. He waved back and yelled something, pointing at the machine, but he couldn’t be heard over the roar of the engine. For almost two hours he continued to circle the mystified group Finally the machine sputtered to a stop. As he dismounted, Callihan sheepishly explained that he had mounted the shut-off switch out of reach from his position in the driver’s seat. Callihan’s original steam vehicle didn’t survive to take its rightful place in a museum as the first horseless vehicle in South Dakota. He took the wheels off and used them for a drag cart — which was very much in character, though it was a loss to history. Edward Scott Callihan lived to see ideas he pioneered become commonplace, the seeds of great fortunes by men in the automotive industry. He died on March 6, 1937 in Woonsocket.